Hyderabad also known as 'city of Nawabs' is known for its irresistible and mouth-watering biryani all across the country. Hyderabad biryani is prepared using the dum method of cooking, including ingredients like basmati rice, dahi, onions, spices, lemon, meat, saffron and coriander leaves. Originated in the kitchen of Nizam of Hyderabad, as a blend of Mughlai and Iranian cuisine. 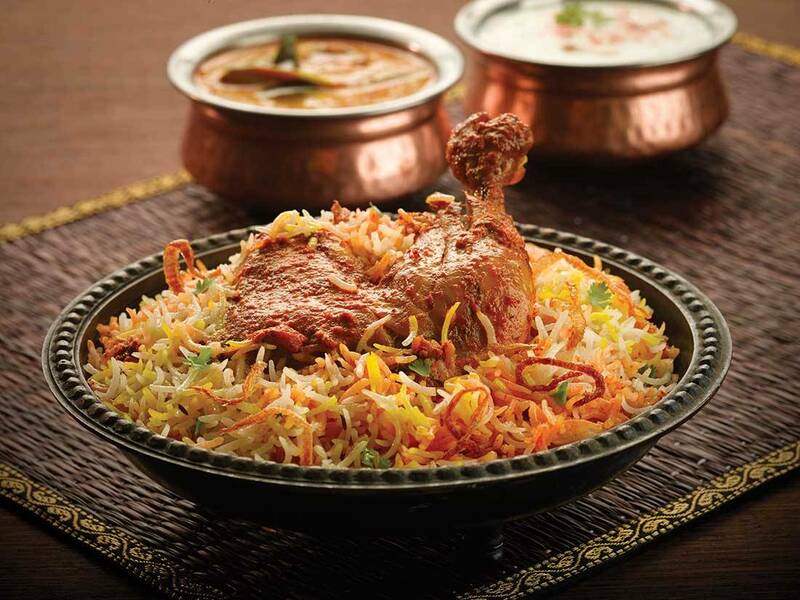 Hyderabad Biryani is considered as the staple and most loved part of Indian cuisine. Usually biryani is served with dahi chutney and mirchi ka salan, along with salad (onion, carrot, cucumber and lemon wedges) to go along. City boasts of its various restaurants that’s serve a variety of legendary and jaw-dropping biryanis. So, to find out Best Chicken in Hyderabad check out of list below. This spot in Madhapur offers mind blowing variety of chicken and kebab dishes in Hyderabad. They specialize in spicy dum ka chicken, zafrani gosht biryanis, mugh tikka and much more. This place brings the most calming ambience with live grill and soft music to go along. Located in Karkhana, this place serves impeccable chicken and kebab dishes in Hyderabad. They specialize in seafood platter, butter and Punjabi chicken, kebabs and some amazing desserts to go along. Hyderabad Chicken is a very special kind of chicken made in Hyderabadi style using chicken, coconut, yogurt and onions. People in Hyderabad love to have it with bagara khana or plain pulao. Popular chicken recipes in Hyderabad are chicken keema, chicken biryani, Andhra chicken curry, chicken tikka, chicken seekh kebab, chilli chicken, chicken 65, chicken leg piece, chicken spring roll and many more. City is also known for its hyderabadi biryani, haleem, double ka meetha and sheer khurma. To know more about places to have Best Chicken in Hyderabad checkout our list below. Located at paradise circle, this place is considered to be oldest Hyderabad's restaurants, offering variety of biryani, kebabs and curries. This place offers the most authentic, fresh and heavenly biryani, having several number of outlets spread across the city. views makes it the ultimate destination for weekends.